Her will be released in Australian cinemas on the 16th January 2014 and is distributed by Sony Pictures. Now showing in the USA and opening in the UK on the 14th February. 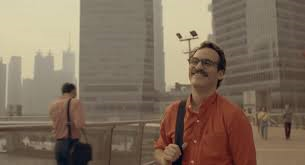 Spike Jonze's Her is like no other. Cynical and thought provoking, yet incredibly sweet and romantic. Her is a scary reminder of how dependant we are becoming on technology and the future we are heading towards as a result of this dependence, yet it is also a reminder of how beautiful life is. A sweet but unconventional love story which see's Joaquin Phoenix give yet another incredible performance is a pleasure to behold on screen and is an absolute must see. Set in Los Angeles in many years to come, Theodore (Joaquin Phoenix) is still recovering from his marriage breakdown when he decides to obtain a new Operating System (OS) which is a voice like our Siri, but actually interacts with you on a conversational level. Theodore's new OS, Samantha (voiced by Scarlett Johnasson) becomes more than just a great help with his technology, but soon helps cure his loneliness and gives him the companionship he has been craving. Like any relationship, these two experience ups and downs, but further complications were always going to arise when one of the two doesn't exist in physical form. In the place in time which we are now, the idea of someone falling in love with a Siri type entity seems ludicrous. However, in Her, director and writer Spike Jonze establishes right from the beginning of the film how technology has evolved to become something which members of society are even more reliant upon. With this basis set for the film, the idea of a human falling in love with an OS does not seem as ludicrous. Everything seems to be made easier by technology that some people don't even need to take the online dating path and just need to purchase an OS and they have a new friend. As entertaining as it is on screen, it is startling to glimpse into the future and see the direction in which we are heading. Are we losing touch with reality? And then we can also ask ourselves, what is reality? Do we determine what is our reality and what isn't? Yet before you start thinking that Her is a little heavy as it makes you question and fear the future, you realise what makes the screenplay truly brilliant. At the core it may be cynical and a little philosophical in regards to it's stance on technological dependence, but it is combined with a very sweet love story. The screenplay is incredibly well written to incorporate both of these and is often very funny. Listening to the way Theodore and Samantha talk to one another and hearing the way Theodore describes what he sees and Samantha describes how she feels and the way she sees the world when she cannot see it is intoxicating. It is easy to find yourself appreciating the beauty if words and how the way things are said can alter your perception of how you see things. Her is also visually beautiful. The use of colour is amazing throughout the film and gives the film a completely unique atmosphere, as though we are not just watching a unique feel, but feeling something truly different as well. The creation of a dystopian Los Angeles is almost addictive, as you feel like you want to explore more of this new world. The city has grown in such an interesting way with an updated (and seemingly much more popular) rail system and an extravagant upside down airplane outside the Pacific Design Centre. Yet you have the contrast of beautiful nature such as the beach and a cabin in the woods in the snow. Music is also of great importance in the film and the musical score is very fitting for the film. Joaquin Phoenix is so incredibly lovable in this film. Phoenix has often played complicated individuals in his past film and while Her see's him playing an unconventional character once again, this is perhaps the greatest connection he has established with an audience. He is so likable and you immediately feel sympathy for his character to the point where you feel you should reach into the world of Her and give him a big hug. In a film where reality is questioned, the way which he exhibits his emotions is extremely real. His character just adds to the beauty of the film and Phoenix's final scenes are perfection. While Scarlett Johansson doesn't appear in the film in a physical sense, she gives a fantastic vocal performance. You may only be able to hear her, but you often forget that you are not seeing Samantha as her emotions are all so visible in her voice. It seems crazy how much you actually feel for her character as well, only to remember that this character is an OS and not a real person. Amy Adams plays a fragile character in Theodore's good friend, Amy. She does well, and like Theodore, is a very real character in a strange situation. Olivia Wilde has a small role as Theodore's blind date, but also does well and Kristen Wiig lends her voice to Theodore's adult chat partner, SexyKitten and is hilarious. The scene with Phoenix and Rooney Mara, who plays his ex wife Catherine, is so real that it is haunting. A meeting between once husband and wife on the verge of divorce where they start off on good terms, but end up fighting about the way things were, which also results in Phoenix's Theodore second guessing himself in a way that only an ex can make you do. Her is pure brilliance in the way that it thoroughly entertains and shows you the beauty in the world, but is also cynical about the world. While the technology aspect of the film may make you question how real our reality is, the beauty of the film is absolutely real.